The early history of the church is obscure, though it appears to have been in existence by the 12th century. 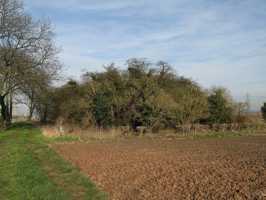 Nothing remains of the church above ground, though it is just possible to make out the place where it stood within the churchyard. A number of headstones are still standing, and inscriptions are legible on some of them. The site is overgrown, but it is possible to make some sort of progress through the trees and undergrowth. and to Chris Brooke for the photographs.